The Warp Nacelles in the raised position, are basically at mid-height of the ship. Think about it. Fifteen decks, so the 'middle' deck is deck 8, which is the deck that is on the 'rim' of the primary hull section. One drawing, more like puts the nacelles as in line with both deck six through nine, so midpoint between deck seven and eight, but physically lets just say its deck eight, so for generating a warp field, the nacelles are exactly central height wise. meaning probably easier to control and more efficient, since they dont have to try to 'bend' the field vertically more in one direction, like with, say... every other class of ship since TOS featuring two 'traditional' nacelles. Now, the Curry type, or 'Shelley' class, a weird fusion of excelsior hulls and oversized constitution-style nacelles seem to place said nacelles at the mid-point. As is the defiant, kind of. Oddly, the Galaxy Class also places the nacelles in the roughly vertically central position. The Norway and the Saber are close, but the vertical centre point is 'outside' the nacelle. Ships that place the nacelles in a vertical arrangement (Challenger), or with four in a somewhat symmetrical layout (Cheyenne, Constellation), and even three-nacelle designs like the Niagara, kind of don't count since they all naturally involve using the different vertical arrangements to better balance a warp field than, say, for the Niagara, the two nacelle Ambassador it's based on. However, unlike those ships, the Intrepid class has moving nacelles... Now, why would that be, when they could just, permanently affix them at the height of Deck eight? even at the angle, since the jump to FTL doesn't occur until after the nacelles reach that position... my theory: a mix of the DITL explanation for the warp damage thing... and for Sublight... Weight Balance in the vertical, aligned to the impulse drives. For my little 'canon-twisting' Tech manual, This is what I'm going with. So, the impulse drives' position, according to the simulators, had to be basically, on deck eleven, as there's a lot of weight in the secondary hull area, with the primary hull, despite its' size, being rather light with lots of cargo bays and such. In this design revision, there is also no secondary deflector on deck six. Part of the weight in that section also comes from it testing a dual warp core design that would be mostly abandoned. The first core, directly behind the (rather heavy) multipurpose deflector array is built for mostly power generation and to act as a back up warp drive, but the primary core being the one that is just ahead of the shuttlebay, which is slightly larger. this produces excessive levels of power for shields and weapons, or something. With the issues with warp travel damage and other things, engineers came up with a stop-gap measure that was specific to the intrepid class, overwise an entire new warp engine design would be needed. This was the re-engineer the nacelles slightly, from the traditional strut connecting to the ventral surface of the nacelle, to instead, the inward-facing surface with only one side of the nacelle with a 'grill'... secondly, 'tilt' the nacelle to provide a more efficient engine that also doesn't cause damage, and, with the tilt in place, have the nacelle strut - in this design, now angled from the secondary hull like the constitution - mounted on a hinge between the impulse drive and the hull, so that at sub-light, the nacelle and strut swivel down to a horizontal position, placiong the weight of the nacelles at sublight speed at deck eleven... in line with the impulse drives, and thereby placing the ships' centre of gravity also in that area, for a 'flat' direction of thrust. This also maybe explains the weird thing with the back of the intrepid nacelles - originally, they were perhaps supposed to be like the galaxy class, in that the grill is on both sides, wrapping around the back, but with the redesign, the back was filled in, but still traces of the original design left in there. However, additional issues crept up, which meant the intrepid class now had a secondary deflector in the primary hull, but the weight of the much-smaller single-purpose system isn't sufficient to cause issue. So I'll go with that the USS Intrepid was officially commissioned in late 2370, (even with the NX registry before eventually being changed to NCC by the time of Nemesis) but had been active for over a year in trials. The Defiant likewise had been active prior to commission for similar time - leaving a mere two year development for the smaller ship, but the Intrepid class had a longer development time. Given how close to completion the sister ships where when the USS Intrepid was commissioned, I'll say that this is primarily why alternatives to a likely-maintenance-heavy hinged pylon design wasn't implemented. like I've mentioned before, I'm also going with the idea that the ship has an 'upper end' crew capacity of 500, though intended role and design places a more 'manageable' crew level in the 300 range, with singular missions like Captain Janeway's allowing for smaller... I'm also going with that, regardless of canon, because Naomi Wildman, who this story follows, got to be part of the Intrepid Class design team, had a few... changes... to make. (So... canon says 150, Naomi says 300?) some changes also incorporate things like from the Prometheus class. Also, she made sure that the Aeroshuttle design was completed by the time Voyager launched, with headcanon being the design was too far behind when voyager was lost, hence why Delta Flyer instead - no one on the ship even knew about the aeroshuttle being a thing, it was so far 'behind'. And in practise, the other ships that ended with one, used it basically the same as a Danube-class runabout, minus interchangeable modules. Just a big short-range shuttle... versus the flyer being designed to handle long range, yet not a large crew count. Yeah... this. You may be rivaling Graham for absurdly cool attention to detail. I don't think there's much any of us are going to contribute to this that's going to add to what you've clearly spent a lot of time and effort in laying out. I think Graham is probably best suited to critique this one, based on the time he's spent breaking down each ship. Never really thought about the placement of nacelles in regards in relationshio to the center of the ship. Good point. I figured Intrepid class in regards to crew complement around the idea of maximum crew comfort on long missions with the added benefit of added automation and smarter computers. Though I still thought 150 was way too small. Figure 90 one shift and 60 on second shift was too small to run a ship as large or larger than a carrier. Trek seems to underestimate how truly large these ships really are. I have been on aircraft carriers and I can say that on night shift how dead it is at night and that is with perhaps 1500 to 2000 crew at that time of night. Hell, there is enough room to have a large apartment sized room for each member of the crew and still have alot of room left over. McAvoy wrote: Never really thought about the placement of nacelles in regards in relationshio to the center of the ship. Good point. I've been saying that for ages. In volume terms, Voyager is at least double the size of a Nimitz class carrier and yet it only has a crew of 140. Nothing wrong with that as such but it means the ship should feel deserted, whole big sections of it with few or no people in them. But that's never what we see when they show the inside. I completely agree, but it's not unforgivable. Could one chalk that up to "Lots of really big science-y equipment?" I know that's a bit contrived, but I think there's at least justifiable reasoning of "We don't use 90% of the ship because _____ takes up so much space on this deck and _____ takes up that"
I'd be all for that, except that it's really not what we see. Whenever we see equipment in labs or whatnot, it's always pretty modest in size. We never see huge multi-level spaces containing giant equipment or anything like that, really. You'd have to be pretty nerdy to do that. Without looking it up, you could say the computer core does take up alot of space. Or at least that is what we sad with E-D. There is also the web of Jeffries Tubes all over the ship. I suppose the phaser arrays take up space along the hull. Among other things. McAvoy wrote: Without looking it up, you could say the computer core does take up alot of space. Or at least that is what we sad with E-D.
Not on Voyager. We've seen Voyager's computer core, it's not that big. I've had discussions like this many times, and it's really hard to get people to wrap their heads around the scale of the problem. Okay, let me put it this way. Voyager has 15 decks. That's an average of 9-10 people per deck. Think about that number for a minute. Think of how big Voyager is. It's 1,125 feet long. Not every deck is that long, but most of the decks are at least some hundreds of feet long, and they're anything from dozens to hundreds of feet wide - 30 or 40,000 square feet of deck space is not an unusual figure for a Voyager deck. And they typically have about ten people on each deck. You can't make that up with a few jefferies tubes and bits of equipment. For it to make any sense at all, you'd have to posit that something like 80% of the entire hull volume is taken up by... stuff that people don't interact with. Giant tanks of replicator matter (but then why is it rationed? ), water, fuel, something. And I really wouldn't mind that. But that is not what we see on screen. Back during my first trip to, uh, "summer camp" in 2010, a friend of mine and I designed a 3 deck tall, 45 meter long nearly cylindrical cargo container, essentially re-purposed into a freighter that might be used at low-warp for deliveries between nearby systems or alternatively as a craft used for in-system science missions (strapped on some nacelles and impulse engines, and a command pod to the front). This was supposed to be somewhat of a mix between Firefly, the Botany Bay, and a smaller version of the Franz Joseph cargo pod. It was little more than a project to stave off boredom as the 2 Trekkies in the dorm. I'll have to dig those designs out some day. Bryan Moore wrote: Back during my first trip to, uh, "summer camp" in 2010, a friend of mine and I designed a 3 deck tall, 45 meter long nearly cylindrical cargo container, essentially re-purposed into a freighter that might be used at low-warp for deliveries between nearby systems or alternatively as a craft used for in-system science missions (strapped on some nacelles and impulse engines, and a command pod to the front). This was supposed to be somewhat of a mix between Firefly, the Botany Bay, and a smaller version of the Franz Joseph cargo pod. 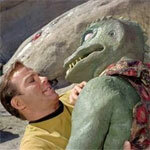 It was little more than a project to stave off boredom as the 2 Trekkies in the dorm. Long ago I had a friend who was part of a Trek roleplay group. They created a ship for the RPG, had somebody model it in 3D and give them deck plans for each deck. It wasn't an especially huge ship, somewhere between Voyager and the E-D in size. My friend would sit down and draw individual deck plans. She was constantly complaining that the ship was massively bigger than they had expected. She'd say things like "I'm putting quarters in, I've only filled eight decks and even with space for lounges, cargo bays, holodecks, etc, I've got 10,000 people on board! Anyway, not to harp on it but these ships are BIG. And Trek ships are amongst the smaller ones in sci-fi. No I agree. Hell an aircraft carrier has a huge open space in the middle of it. The Hanger Deck, 25 feet high, roughly 800 feet long, about 100 feet wide. Still can fit alot of people in it. Intrepid is just too big for its crew. Just slightly less than double of the Defiant. Defiant I can understand having a small screw since the ship is smaller and it's over volume is much less because it has huge nacelles attached to it. Hell you could make an argument that the shuttle bay could be larger than it is. What we see on screen, really feels like more like 500 crewmembers. Was it you who suggested that for the Badlands mission the science staff was probably omitted, at least most of it? I'd be happy to take 140 as a base crew, and say that in addition there is a standard science staff of about another 200 or so. 350 would still be absurdly low for a ship Voyager's size - hell, 3,500 would be low - but at least it would be more believable. Graham Kennedy wrote: Was it you who suggested that for the Badlands mission the science staff was probably omitted, at least most of it? I'd be happy to take 140 as a base crew, and say that in addition there is a standard science staff of about another 200 or so. 350 would still be absurdly low for a ship Voyager's size - hell, 3,500 would be low - but at least it would be more believable. 1000 is low for a Galaxy class too, but at least these are considered space hotels, which does not seem to be for Voyager. And yet when Voyager had a couple of hundred passengers (the Klingons in "Prophecy") the sense was of an overcrowded and strained ship. In "Friendship One", transporting five and a half thousand people from one planet to another was stated to require "at least" seventeen trips, indicating a total capacity of closer to 450 than 500. The numbers don't make sense, but they're consistent.